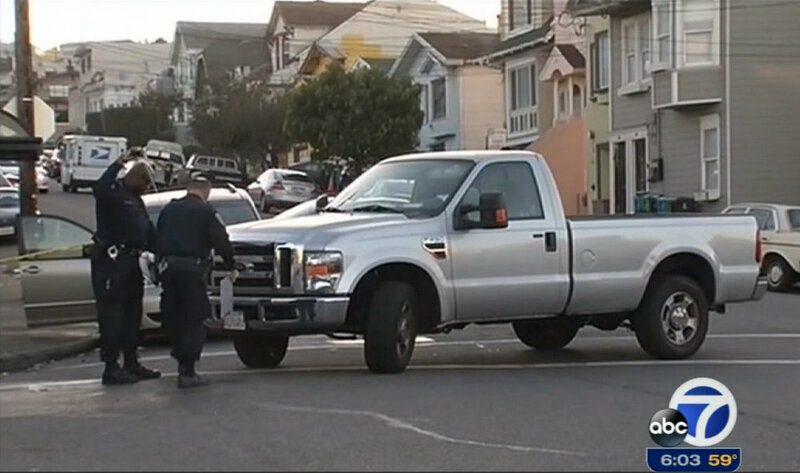 In what could be a departure from the SF Police Department’s usual failure to penalize reckless driving, officers have arrested two of the five motorists who have killed people on San Francisco streets since December 20. In the last hours of 2013, the year’s pedestrian death toll increased to 20. Both of the crashes in which the drivers were arrested took place on New Year’s Eve, and appear to be the fault of motorists who failed to yield to people in a crosswalk. Last year, none of the other sober drivers who killed pedestrians without fleeing the scene are known to have been charged. In one incident, at about 3:30 p.m., 86-year-old Zhen Guang Ng was run down in a crosswalk at Naples and Rolph Streets in Crocker-Amazon by 69-year-old Giampaolo Boschetti, who was booked on charges of vehicular manslaughter with gross negligence and failure to stop at a stop sign, according to police. In a later crash at 8 p.m. in the Tenderloin, an Uber ride-share driver, 57-year-old Syed Muzzafar of Union City, ran over a mother and her two children in a crosswalk as he turned right at Polk and Ellis Streets, according to reports. All three were hospitalized, and six-year-old Sofia Liu died from her injuries. 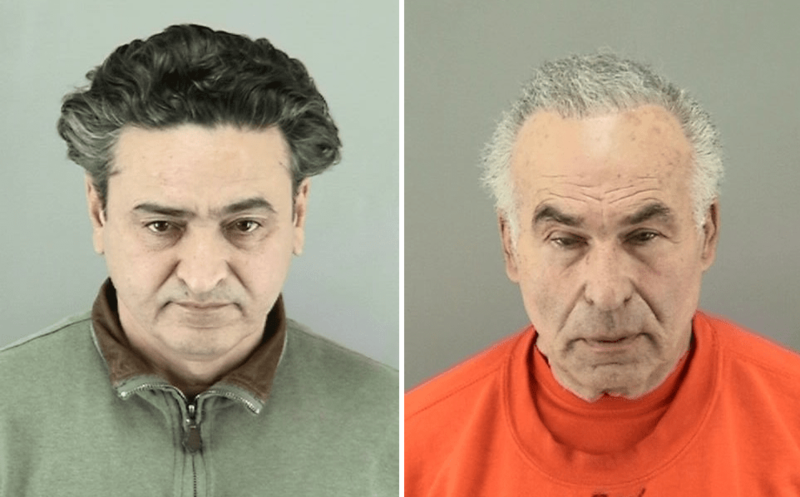 The SFPD said Muzzafar was arrested on charges of vehicular manslaughter with gross negligence and failure to yield to pedestrians in a crosswalk. Before the arrests were announced, SFPD Traffic Company Commander Mikail Ali told the SF Examiner that he mainly attributed the recent rise in pedestrian deaths — a six-year high — to the increased walking and driving that comes with job growth. He also appeared, however, to take a more serious tone towards “grossly negligent” drivers than the department has conveyed in the past. Historically, the SFPD has been reluctant to arrest, charge, or even cite drivers who kill pedestrians, even when presented with strong evidence of the motorist’s error. In 2012, the department only issued a citation to a shuttle driver who ran over a man with a cane in a crosswalk — and that only happened after the event was shown on video, eliciting an outcry from pedestrian safety advocates. Throughout the Bay Area, 60 percent of the 238 drivers found to be at fault in pedestrian deaths between 2007 and 2011 faced no criminal charges, according to a report from the Center for Investigative Reporting last April. As the Examiner reported, the SFPD had an exceptionally low staff of 1,600 officers as of last June, and expects to see its force grow from the current 1,700, given the number of recruits in line. Ali said the SFPD hopes that will result in “a marked increase in traffic enforcement” this year. Schneider said Walk SF and the SF Bicycle Coalition are helping the SFPD produce a video to help train all officers in pedestrian and bicycle crash investigations. There’s still no word on any arrests or citations issued for the three other pedestrian deaths that have occurred in the past two weeks. On the morning of December 20, a 76-year-old female driver was reportedly parking her car near Jackson and Stockton Streets in Chinatown when she suddenly accelerated, striking a parked car, a utility pole, and two people. All three were hospitalized, and 84-year-old Isabel Huie died from her injuries. Police say they’re still investigating the crash. That same morning, the driver of a Recology garbage truck backed over and killed 49-year-old Donald Yazzie on Jones at Antonio Street. Police told KTVU they have video footage of the crash, but have not announced any arrests. On December 29 at about 2:35 a.m., 47-year-old Michael Gutierrez was killed by a driver near the Fourth Street on-ramp to I-80 in SoMa. The California Highway Patrol is investigating the crash and has reported no further details. 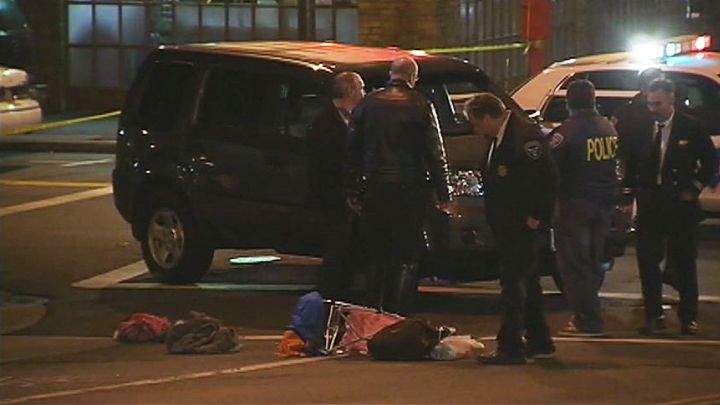 The morning of New Year’s Eve, a hit-and-run driver also seriously injured a woman at Turk and Leavenworth Streets in the Tenderloin. Schneider said the SFPD has since reported arresting the driver. There are no words to express the deep sadness and grief felt for the death of young San Francisco resident, Sofia Liu, our second pedestrian death in the Tenderloin in the month of December and the 20th pedestrian fatality in San Francisco, the highest in 6 years. A disproportionate number of these fatalities occurred in the Tenderloin and SOMA neighborhoods, which continue to present the highest number of traffic collisions in San Francisco. It appears to have been 100% avoidable by driver compliance with basic traffic laws, specifically yielding to the pedestrian right of way. Unfortunately this is one of the top five driver violations that lead to pedestrian injuries and deaths, along with speeding, running red lights and stop signs and turning violations. According to the SFPD’s own collision reports, an average of 2 to 3 pedestrians are hit by drivers every day in San Francisco, a staggering statistic that has elevated the need for improved traffic enforcement in our known high-injury corridors. In addition, the driver was a non-taxi, for-pay driver. Certainly this incident raises questions regarding the driver training and selection process for the increasing number of ride share drivers on our city streets. While emerging driver service apps fulfill an important need for flexible on-demand transportation in San Francisco, we must examine a universal baseline of scrutiny and safety oversight for these services. In addition to data-driven traffic enforcement, Schneider said it’s crucial that city officials act quickly to ensure safety improvements on streets like Polk, where Liu was killed. The SFMTA is expected to approve a plan for Polk in the coming months that has been fought by merchants who want to preserve car parking. Bay Area cities need to take their cue from New York’s new mayor deBlasio and new police chief Bratton who are embarking on a plan that eliminates nearly all traffic deaths in ten years. Vague talk of educating drivers or pedestrians to be more aware, or worse, saying that one needs a large increase in police staff, is just nonsense. Prosecuting only the grossly negligent and drunk is equally useless, since most collisions are caused by drivers’ intermediate forms of risk-taking and inattention. Without a context-driven enforcement of what matters most to pedestrian and bicyclist safety, nothing will change much. More ticket revenue from easy-to-spot citations does not necessarily mean safer streets. Police need to push us to change our city’s street culture by enforcing what matters — the most dangerous driver behaviors that kill rather than annoy and inconvenience others. These include behavior around intersections such as failure to yield to weaker parties; running red lights; rushing past pedestrians still in the crosswalk; aggressive/risk-taking while driving; speeding near pedestrians or bicycle riders; and texting while in motion. drivers who killed people while driving. What is wrong with the SFPD??? Hpeofully this is changing. The best punishment and justice in wrongful/negligent death involves victim compensation, rather than perpetrator punishment. I would like to see federal legislation that mandates minimum compensation to victim’s families set at $1 million. To adequately control for amoral murderous investment bankers, there could be a further stipulation that the amount be set to the greater of $1 million, or 5 years’ salary (based on previous year AGI). Additionally, add 500 hours of court-ordered community service. The financial judgment should never be allowed to be discharged in bankruptcy court and should be paid to IRS and redistributed to the victim’s estate as either a $600,000 lump sum, or $200,000 per year for 5 years. And why no lifetime ban on driving? It should be game over for any driver if they kill someone while operation a motor vehicle. Also, how is this a deterrent to those wealth enough to pay this weregild from driving recklessly? If they know all that they need to do is pay $1 million and move on, what’s to stop them from killing again? Any punishment must include complete revocation of driving license, probably for a lifetime in the event of a fatality, and for years in the event of an injury. People must learn that driving is a privilege and, due to the massive forces created by a car, any lack of due diligence (i.e., not paying attention), first and foremost results in a revocation of these privileges. After that, I agree that a lot of community service must be required. But I would add that it needs to be spent working on advocacy for pedestrian and/or bicycle improvements. There is nothing that would teach a motorists how dangerous driving is than having to truly understand the BS and bias pedestrians and bicyclists have to put up with. lately the corrupt government in San Francisco change a lots of traffic rules. for example no turn on red. this street is very bad and it takes years to fix them. say no to corrupt government in San Francisco. judges and attorneys destroyed our community. Instead of waiting for people to die, we need to be revoking the licenses of drivers who have frequent “close calls.” But SFPD doesn’t seem terribly interested in traffic enforcement. Because most SFPD officials, and indeed most members of our legal community, believe that driving a car is necessary for physical, psychological and economic survival, they are reluctant to impose any penalties that involve restrictions on driving, or even cite drivers for offenses that might risk the driver’s future ability to drive. In this world view not being able to drive is a fate worse than jail. This is why the SF legal system allows most DUI’s to be plea-bargained down to wet or dry reckless (offenses that do not involve license suspension.) This is why “professional” drivers are held to a less strict standard than “amateur” drivers and rarely cited for offenses on the grounds that they would lose their ability to perform their job. This is why victim blaming of pedestrians is so rampant–the majority of people identify with the driver’s potential loss of driving “freedom” rather than the loss of life of the person too poor (or, perhaps, too crazy a fitness nut or an environmentalist) to wrap themselves in 3000 pounds of steel. Of course this set of values in the waning days of the age of oil is dysfunctional to an almost sociopathic degree. As economics, peak oil and environmental crises drive more and more people to live densely and car-free, the conflict between car drivers and non-car drivers will escalate. Politicians and legal justice systems would do well to consider the eventual effect on civil order if car privilege is protected for the haves, and vehicle-caused death, disease and destruction are allotted to the have-nots. One of the many fronts Folks for Polk has been working on is exactly that. Not only compensation for injury but addressing what’s underlying the City’s ‘timidity’ in creating properly safe infrastructure: the threat of appeals and other legal action. We’re going to turn that around on the uninformed, obstinate, rabid few who oppose best practice such that the City is intimidated into noncompliance with extant legislation (e.g. SB 375, AB 32, 2011 Road Repaving & Safety Bond) and its own infrastructure plans (e.g. Complete Streets Project, The Bike Plan). Prevention is key and way better than cure – punishment of drivers still means too many people are getting killed and traumatized. The real push has to be in building infrastructure that totally minimizes collisions to begin with. Reflexive victim-blaming is akin to tribal rituals intended to delay death, vanquish enemies, and enhance fertility. In other words, if it’s collectively agreed upon that cyclists and peds that are hit bring on their own fate via carelessness or stupidity, then the rest of us can feel masters of our own fate and believe that if we’re just vigilant and smart, we’ll never be victims of these horrific crashes. As the readers of this blog know, random sh__t happens, and happens more while negotiating streets designed by mobility dinosaurs. And while robotic cars are on the horizon, they’ll only be an improvement if they’re sustainably fueled and if there are fewer cars, full stop. they would lose their ability to perform their job. The irony of this is brutal. The “professional driver” proves they are incompetent at their job but we won’t pull their license because that is the equivalent of getting fired – from a job they have just proven they aren’t capable of performing correctly. You can’t squeeze blood from a turnip. What if the other driver is unemployed? Unless the other driver is an indigent 70 year old, the person can have all future wages garnished to pay to the victim’s estate. If a road victim compensation insurance was established at the federal level, all victims could be immediately compensated, with the IRS getting keeper’s rights over the actual assets recovered from the murderer over the course of their remaining lifespan. gneiss, I assume there you meant to add “if and only if criminal liability is proven and a conviction for reckless driving is found”? One accident in the news today is a guy who stole a SUV crashed it on 280, then attempted to escape by running across 280 and was hit and killed by a passing vehicle. It would be harsh on the driver who hit him to get a lifetime ban, don’t you think? That is what insurance is for. So the fact that a driver is judgement proof does not mean that the victim gets nothing. Nobody but nobody carries $2million worth of liability coverage. The victim is left with nothing, and that is assuming the insurance company is willing to pay. If the collision was deemed an accident, the financial liability should still fall on the motorist, though it is doubtful the insurance companies would agree. Obviously the answer is “yes” to your question, but you have to be really careful here because it creates a massive loophole, specifically, the one that is currently used *all* the time right now: the “poor” driver didn’t do anything wrong and just didn’t *see* the pedestrian or bicyclist. In other words, we actually need unbiased investigation as to who is actually at fault. Currently, the police and DA are massively biased and somehow always find the motorist innocent of any wrongdoing or liability. This is what has to change. Sure, if a car is driving 25 mph in a 25 mph speed zone and a pedestrian is hiding behind a parked car and jumps out at the very last second in front of the car, clearly this is not the motorist’s fault. But that is rarely how it happens. The vast majority of the time, the motorist simply isn’t paying attention (or drunk) and/or driving too fast and recklessly, and then they “find” a pedestrian in their path when it’s too late. However, had they been driving with due diligence and proper respect for the power at the tips of their feet and fingers, they would have easily seen the pedestrian and taken preventative measures. Yet this kind of crap here the driving was acting carelessly is routinely passed off as an “accident” for which there was “obviously” nothing the motorist could do to prevent the collision. Sanfordia, my umbrella policy has a liability figure of 2 million, but I had to ask for that and so suspect that almost everyone carries less.. But p_chazz’s comment is valid. Relatively few people have the means to personally cover a 7-figure personal claim. And if someone’s future earnings are all garnished, there is a good chance they won”t see much point in going to work at all. Or just move overseas. Improving driver and vehicle insurance is the way to go, along with more enforcement of the estimated 20% of CA drivers who do not carry updated and adequate insurance. That just creates an incentive to not work, or to earn money in the cash economy. Why bother getting a job if the govt is going to confiscate your earnings? Why not just demand the death penalty for drivers who kill peds? An eye for an eye! You know you want to. No. I just want their driver’s license. Sad that these accidents happen, for sure the drivers are just as extremely shocked and are already punished for life, just as the family and friends of the victims. I don’t think punishing hard will help decrease the number of accidents. Better driving education would probably and a big part is I think the bad road design and the setup of traffic lights (let pedestrians walk first). Also stop signs is the most ineffective way to handle a crossing and creates a lot of confusion, which results in less focus for the area the driver should be focused on. For me the signs here are like books, why not use icons, so you can quickly see what is meant no matter what language you speak. Separate bicycle lanes, acknowledging that no matter what rule you make, certain traffic has certain behavior (like pedestrians easily crossing red lights) and try to make every individual situation as safe as possible. I’m sorry for all those people involved in these horrible accidents. Is SFPD Serious About Cracking Down on Distracted Driving?